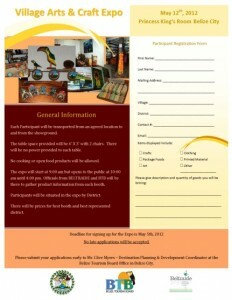 The BTB is inviting all small village producers in the country to be a part of the first ever "Village Arts and Craft Expo" on Saturday, May 12th, 2012 at the Princess Hotel & Casino from 9:00 am - 4:00 pm. The Village Arts & Craft Expo is a collaborative project between BELTRAIDE, the National Association of Village Councils (NAVCO) and the BTB. Its major initiative is to showcase the arts and crafts of the country's villagers. The Expo is expected to draw small craftsmen from across the country that will be able to exhibit their products in one location to the public. All small village craftsmen are invited to apply today at the BTB office on Regent Street in Belize City, and become a part of this memorable event. Clive Myers, Destination Planning & Development Coordinator at the BTB said, "Small village entrepreneurs suffer from brand recognition and are always in direct competition with inexpensive neighboring imports in terms of arts, crafts and packaged goods. 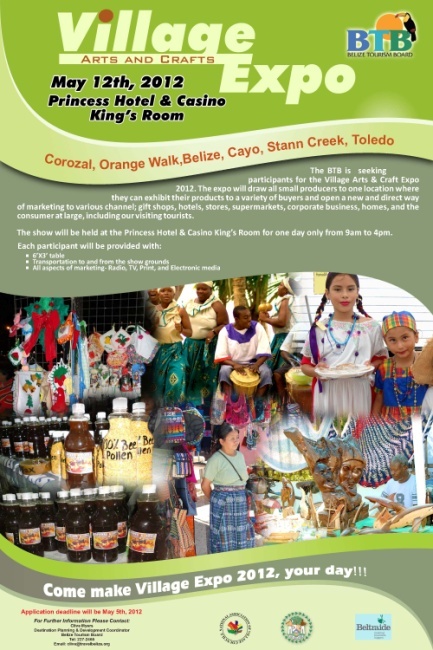 The Village Expo will afford them the opportunity to market their product while gaining recognition by the Belizean public and other visitors." The deadline for applications is May 5th, 2012. Each participant will be provided with transportation to and from the Expo, media advertisements and a 6' x 3' table. The Village Arts & Craft Expo will be open to the public free of charge on May 12th, 2012 at the King’s Room in the Princess Hotel & Casino from 9:00 am – 4:00 pm. There will be live cultural performances.